These things are ALL OVER IOWA. It’s beautiful, it’s wonderous, it is GLORIOUS. Best thing I’ve come across on the internet in a LONG time. I have an upstairs toilet. My main bathroom is downstairs. Upstairs is just something closet sized, with just a toilet. No sink. A light, and a very old toilet that needs replacing. It is so old it is Harvest Gold and Avacado Green. Really. I saw this, the sink on top of the tank, and realized it would make the upstairs emergency bathroom much more functional! It is a sink on top of the tank, uses the water straight from the source, and then drains into the tank, filling it. So not only do I now have ROOM for a sink, it is a money saver, and it’s green, too! I’m pretty happy, it seems to be just in the $100 range, which is more than reasonable to add a sink AND save water. The new camera I got for cheap-cheap at Shopko seems to be working nicely. For $55, can’t beat the quality, if you ask me. 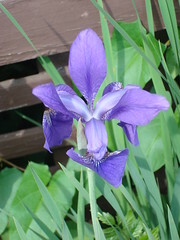 This is a mini iris in my front yard, so this is a macro.